The Homcom motorised electric treadmill may be simple, but it will still give you a great workout. If you’re not concerned with the bells and whistles that other machines offer, this is a great choice as a starter treadmill or for users who are on a tight budget. In this Homcom treadmill review, we’ll look at the machine’s features and how well it performs during a workout. 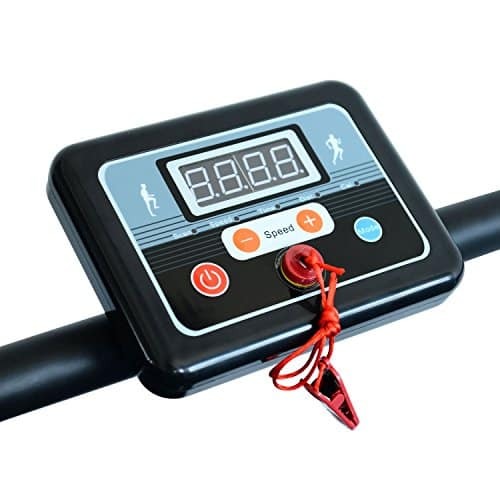 The Homcom motorised treadmill is a brilliant little machine that’s so simple and easy to use. Unlike other larger and more expensive models, this treadmill takes up less space in your home and is surprisingly lightweight. The machine comes with a standard LCD screen that displays important stats, like workout time, speed, calories burned and distance. 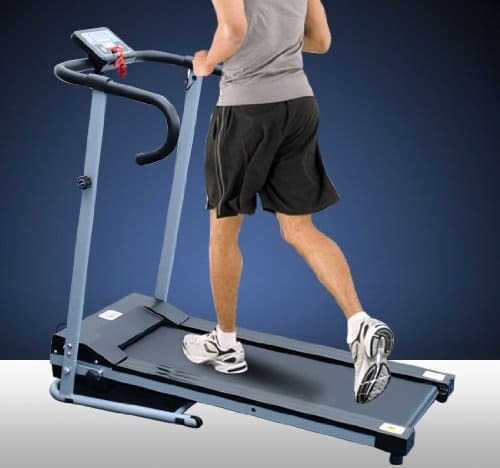 It’s important to keep in mind, however, that there is no adjustable incline feature with this model. The speed of the treadmill can also be controlled from this panel. It’s simplistic, but practical and easy to use. You can run between 1 and 10 km per hour on the Homcom treadmill, which makes this a great choice for users of all fitness levels. Simply press the “Speed+” button to increase your speed. When the treadmill starts up, it will start at 1km/h. The emergency stop switch can be found in the bottom center of the LCD panel. You can attach the clip to your shirt or wrist band. Should you fall down on the running belt or the speed of the treadmill gets to be more than you can handle, the emergency switch will immediately stop the belt. This safety feature can help prevent injuries or belt burns in emergency situations. The compact, space-saving features of this treadmill are fantastic, and the machine only weighs 28kg. It’s easy to transport, and you can tuck it away in the corner of a room in between uses. Because of its space-saving features, this is the ideal treadmill for users who live in small homes or flats. The machine can be a bit noisy when in use. If you have downstairs neighbours, you may want to get a treadmill mat to reduce the noise. If you’re looking for a starter treadmill or a machine that’s compact and lightweight, the Homcom motorized treadmill is the ideal choice. It’s a bit smaller than other models, so look elsewhere if you are over 6ft tall or have a wide stance, but otherwise it provides a great workout and is affordably priced.